FRANKLIN, Mass. – After Canton stormed back from two goals down in the opening two minutes of the third period and with both teams create chance after chance in a fast-paced, end-to-end finish, both teams could have been forgiven for feeling content with going home from Wednesday night’s game at the Pirelli Veterans Arena with a hard-fought point apiece. But there was one more twist in this rivalry tale, as a Franklin defensive clearance ricocheted off the skate of the ref and fell right to Canton junior Johnny Hagan. The forward stepped in and ripped a one-timer over the blocker side of Franklin goalie Ryan Cameron to seal a dramatic 3-2 win for the unbeaten Bulldogs. Franklin coach Chris Spillane was understandably frustrated to watch his team let a two-goal lead slip only two minutes after the second intermission. The Panthers tried to set a physical tone from the opening face-off and were flying around, chasing pucks into the corners, and creating scoring chances. It took seven minutes for the hosts to grab an advantage. 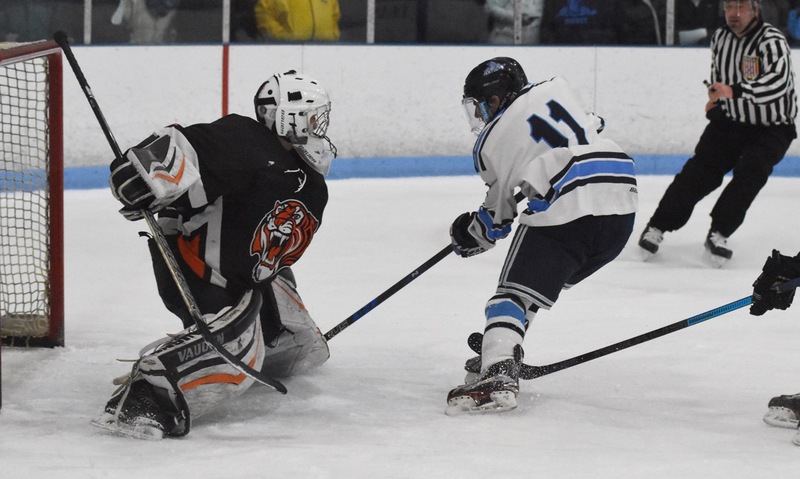 Zac Falvey raced into the zone and when he got to the edge of the right face-off circle fired a shot through the legs of the retreating defenseman that beat Canton goalie Mike Staffiere (26 saves). Falvey nearly added a second goal in the final minute of the first when he got a shorthanded breakaway, but he put his shot just wide of the post. Canton had several great chances to even the score in the second period. Colby Ciffolillo had time and space in the slot, but his shot was smothered by Cameron (30 saves). Ciffolillo then set up Declan Pfeffer right in front but his deflection was knocked down by Cameron and covered. The Bulldogs got a power play chance and Ryan Nolte had a good look off the first face-off but his backhand shot was saved. After nearly scoring on a shorthanded break in the first period, Franklin doubled its lead by finishing one in the second. Scott Elliott collected a loose puck at the blue line and raced past the Canton defense before firing an unstoppable shot past Staffiere to make it 2-0. The chances kept coming for the Bulldogs with Owen Lehane flicking a shot through traffic that beat Cameron but not the crossbar and then the Franklin goalie again came up with a big save to deny a wide open Matt Martin, who was set up by a cross-ice pass from Chris Lavoie. Coming out of the break, Canton jumped all over the Panthers. 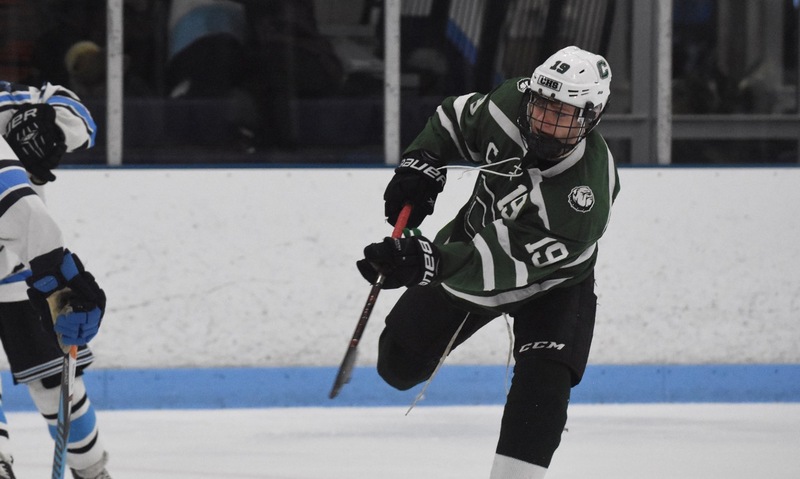 Timmy Kelleher struck the bar just seconds after the period started and then Tommy Ghostlaw had his rebound effort saved by a sprawling Cameron. Nolte skated the ensuing face-off down to the red line before picking out Jack Connolly all alone at the point. The defenseman lined up a shot that went through a mass of bodies in front and found the back of the net just 36 seconds into the third. Less than two minutes later, the game was tied. Ghostlaw didn’t miss this chance on the rebound, lifting his close-range shot over the shoulder of Cameron to make it 2-2. After the Bulldogs had the first seven shots of the period, Franklin got back into the game and had chances of its own. Dan Magazu had a one-timer kicked aside by Staffiere, who was also forced into good stops on Kyle Hedvig from the left dot and Declan Lovett from the point. The Panthers had another breakaway midway through the period but Staffiere read Shane McCaffery’s move and got his right pad to the post. Canton nearly got a winner when Kelleher got behind the Franklin defense, but the combination of Cam Cassella and a diving poke from Cameron kept the puck out. The Bulldogs did get a power play from the chance and on the ensuing face-off Hagan got free in the slot and struck the post. Hagan didn’t miss on his next chance, putting the Bulldogs ahead for the first time with a rocket into the corner. 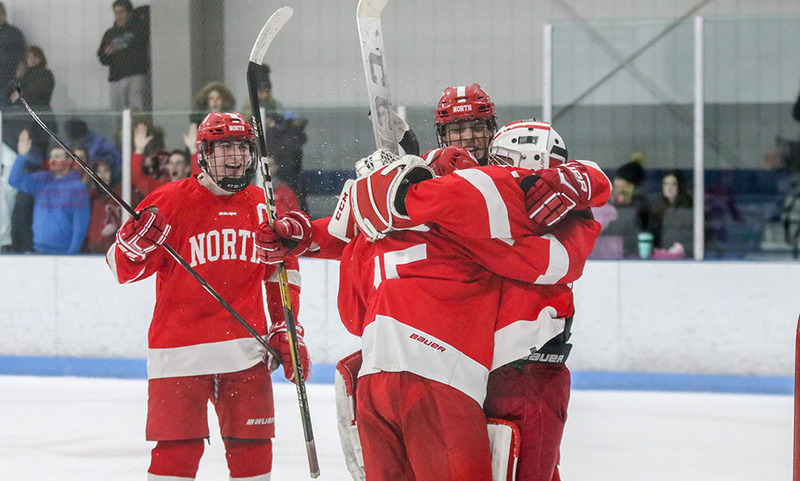 The Panthers managed one last chance in the final seconds, but Tom Tasker’s shot went over the bar and Canton skated away with two more points and a grip on a potential ninth straight league title. Canton (12-0, 7-0) can wrap up another Davenport title on Sunday afternoon when it travels to second place North Attleboro. A point will be enough to clinch the title outright. Franklin (5-5-4, 4-1-2) has slipped a point behind Mansfield in the league standings heading into a trip to King Philip on Saturday.